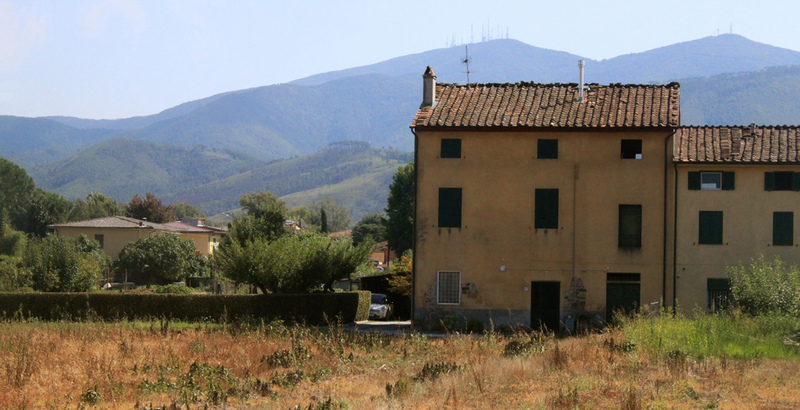 A drive through Tuscany is a feast for the eyes. Rows of cypress trees and huge fields growing tomatoes and olives are just what you’d expect. Every now and then you spot a small stone house nestled in a field and imagine the family that wakes each morning under the orange roof. One of the many sights as our bus drove through Tuscany. Before arriving in Florence we stopped in Pisa which was a great way to break up a long trip. I remember seeing the Leaning Tower in the distance and my breath got caught in my thought. I had always wanted to see this architectural nightmare turned infamous landmark. The area surrounding the Leaning Tower of Pisa is very touristy with lines of vendors selling every cliche souvenir you can imagine. It was fun, however, to peruse the small stands knowing that each time you glance up there are dozens of people trying to take that classic “look at me, I’m holding up the tower” picture. 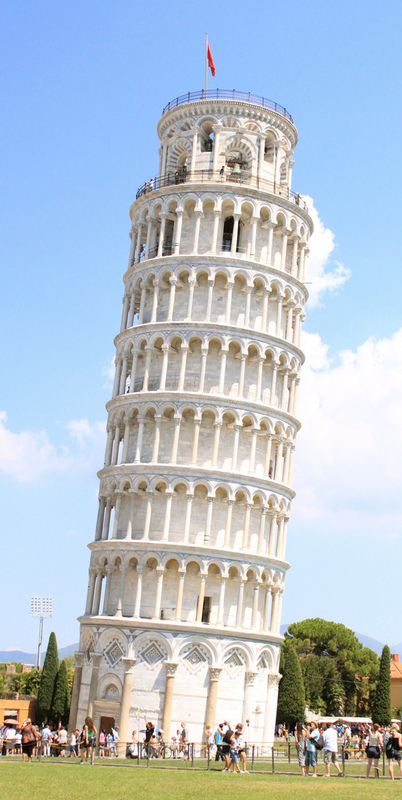 The one and only Leaning Tower of Pisa. A bus that runs several times an hour takes visitors to the Piazza dei Miracoli and a ticket is a little over 1 Euro. From there it is free to stroll the grounds. If you’d like to climb the tower be prepared to pay 15 Euro. We ended the day in Florence at the Hotel Europa. The hotel itself was very modest but was located in a quaint square that had a gelatto shop, post office and rail station. We had a very lively dinner with lots of music, dancing and wine. The sight of my small but comfy bed was a pleasure at the end of such a long day. Florence may be my favorite place in Italy. Despite my small hangover from the previous night (damn Chianti) I hit the ground running to see all that this great city had to offer. First thing that morning, our group was strolled through a leather store (apparently Florence is known for its leather). Since spending hundreds of dollars on hand crafted Italian leather was not in the stars for me I dipped out early to walk around the Piazza Santa Croce. The centerpiece of this square is the Basilica of Santa Croce which is the burial place for some of Italy’s most renowned individuals including Michelangelo, Machiavelli, and Galileo Galilei. Admission is 5 Euro and well worth it. 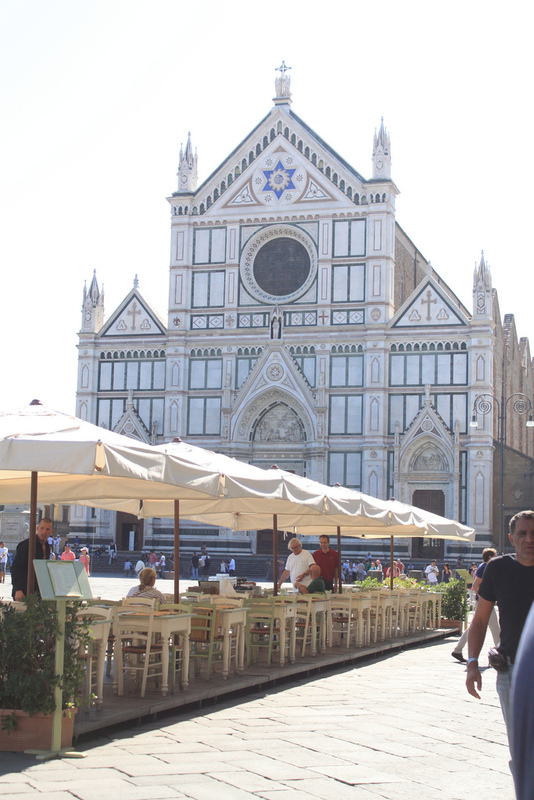 A sidewalk eatery in the PIazza Santa Croce with the Basilica of Santa Croce in the background. Afterwards, Stacy and I weaved along the narrow roads to the Piazza Signoria and admired its many sculptures. This piazza is also home to Palazzo Vecchio, the town hall of Florence. This area proved to be a great place to rest and people watch. 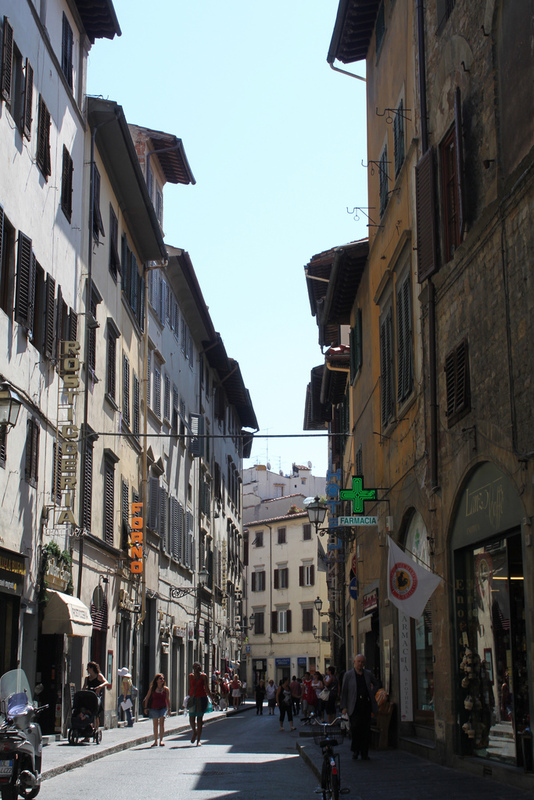 A street in Florence, Italy. With only a day, it was impossible to see everything that Florence had to offer but I dream of a time when I can return and discover this city on a more personal level. 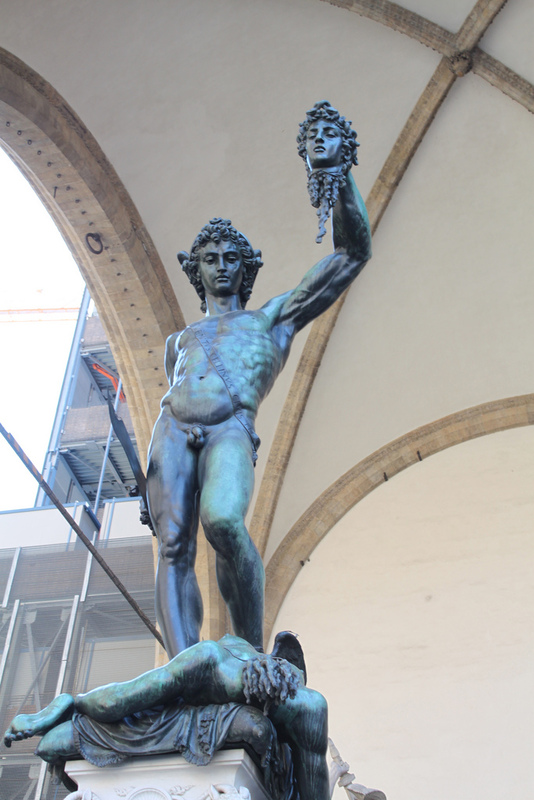 A statue in Piazza Signoria depicting Perseus after he killed Medusa. – Ending the day with white wine at a sidewalk restaurant and basking in the awesomeness that was Florence.